George Ripper caught the winning founder with a 2.0 pound fish and won the handmade fishing rod by local craftsman Mike Buehler. Matt Turkowski from Roxborough for largest fish, a catch-and-release brown shark. Mat won a landing net. Rose and Savanna each won a prize for ugliest catch. Savana won a fishing rod and Rose won a tackle box. Tyler Carneglia, 8, won a fishing rod in the category for largest crab at 6 1/2 inches. Hayden Sowers, 8, won craziest catch prize for catching an oyster cracker, a horseshoe crab and a turtle all in his crab trap. Hayden won a tackle box. 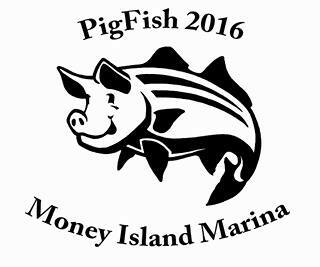 Our fun summer fishing tournament and pig roast BBQ will be Saturday, August 6 at Money Island Marina. Registration is $25 that includes a T shirt, bumper sticker and dinner. There will be multiple prize categories. For the BBQ guests only we request a $15 adult/$5 child donation to the bucket to help cover food costs. BBQ will be served 2 PM – 6 PM. Note the change in time of the BBQ to avoid the risk of late afternoon storm. Prizes will be awarded at 5 PM. Grand prize for the fishing tournament will be a unique handmade fishing rod by Mike Buehler (with reel), a $250 value. Dinner: Barbecued roast pig with horseradish or barbecue sauce on round rolls, corn on the cob, baked beans, Tony’s red potato salad, local grilled organic vegetables. Desert: watermelon and cookies, cake. Our policy on adult beverages: Marina barbecues traditionally go hand-in-hand with an adult beverage. We do not sell alcohol. We do not serve alcohol. We don’t police drinking. Guests are welcome to bring their own drinks. There are typically limited reasonable quantities of beer, wine and coolers available here for guests who wish to help themselves when attending social events here. Drink responsibly and be responsible for your underage guests. Late entrants still get a T shirt, but we might not have your size on the day of the tournament. These categories may be revised before the morning of the tournament to better match the pool of entrants. Tom Smith is the tournament official. All contestants registered and paid online or in person by noon on August 5 are eligible. All species are eligible. All fishing locations are eligible. Registration on the day of the event must be in person before noon. Catch and release fish are eligible. Take a cell phone picture with a ruler in a manner that is least likely to injure the fish. Winning contestants may be asked to verify that the fish was caught on that day. Check-ins must be before 4:45. Prizes are awarded at 5 PM. Most prizes will be an award certificate and a small gift from a local business. The grand prize will be a handmade rod with a reel donated by local craftsman Mike Buehler. 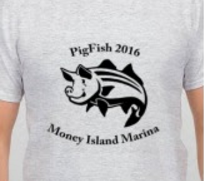 This prize will be a lottery among all fishing tournament contestants. Mike’s other rods are available for sale at the bait shot for $199. The determinations of the tournament official will be final. Rules may be expanded or changed prior to the tournament. (We will cater the prize categories to match the entrants).